After telling the tragic fate of Actaeon, the grandson of Cadmus, founder of Thebes, Ovid describes the next disaster to strike the house of Thebes, in the bizarre myth of Semele, Cadmus’ daughter. In his Metamorphoses, Ovid does not detail how their relationship came about, but simply states that Semele became pregnant by Jupiter, with the implication that, for once, their relationship is consensual. Jupiter then seizes her unborn baby, and continues the pregnancy by sewing that foetus into his thigh. When the baby is eventually born, he becomes Bacchus, who later rescues Semele from the underworld, and has her installed as a goddess on Mount Olympus. I have recently looked in detail at paintings of this story, and shown how many artists have deviated considerably from Ovid’s account. I suspect that this resulted from the combination of the unreality of events in the myth, and the visual challenge posed by its climax. 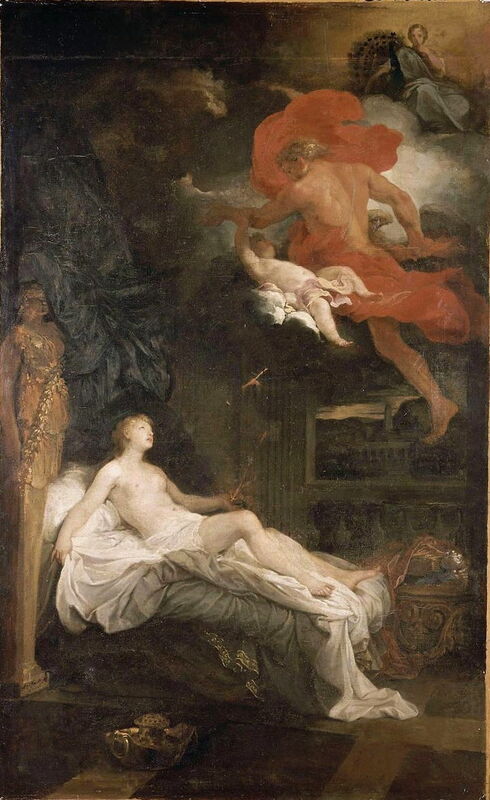 Bon Boullogne’s Semele, painted at the end of the seventeenth century, is one of the few paintings to give a close account of the climax. Semele lies on a bed beside a Roman herm (statue). Her left hand has been struck by a small thunderbolt and is already starting to burn. Above her, Jupiter is making off with a large infant – not just full-term but far older, it would appear – while Juno, identified clearly by her accompanying peacock, is in the distance, at the top right. The young Bacchus is shown as being more than half the height of Semele, which suggests that this may be multiplex narrative, where the upper scene with the gods takes place considerably later than the lower scene with Semele. 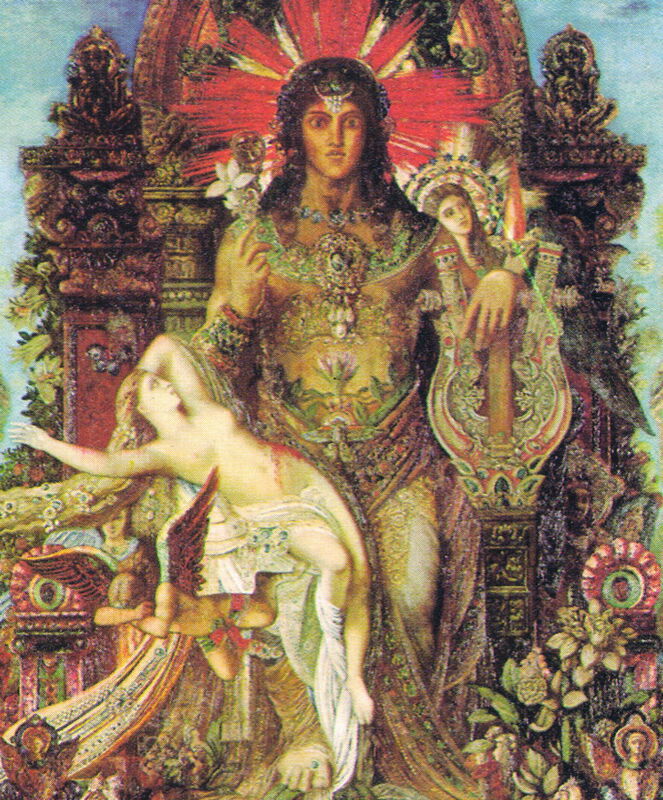 The next artist to make an attempt at a painting which follows Ovid’s narrative was Gustave Moreau, about two centuries later. 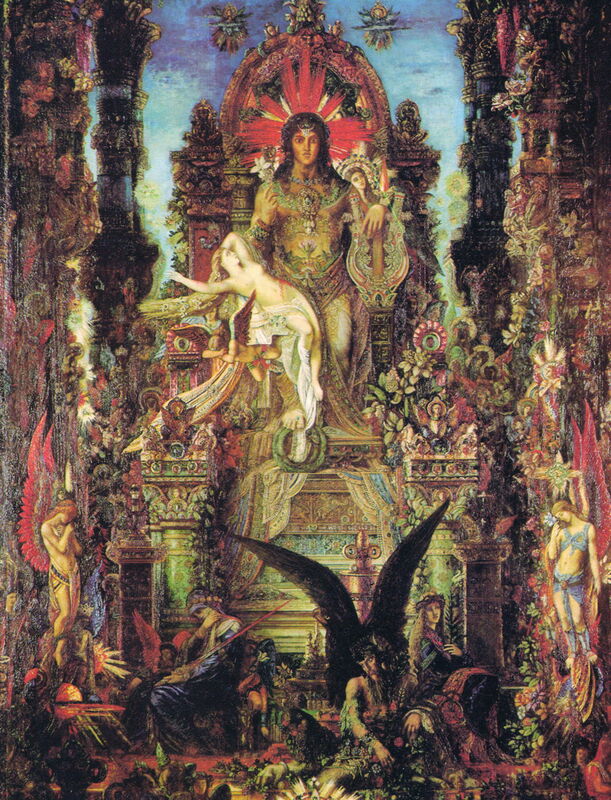 Moreau worked out the composition of the central section of his second and more ambitious painting in his earlier Jupiter and Semele, made during 1889-95. Semele has not yet been harmed by thunderbolts, but the foetal Bacchus appears to be resting against her, and Jupiter has assumed his divine form. At the foot of the painting is Jupiter’s eagle. That composition then formed the centrepiece of his large finished painting, also titled Jupiter and Semele (1895). 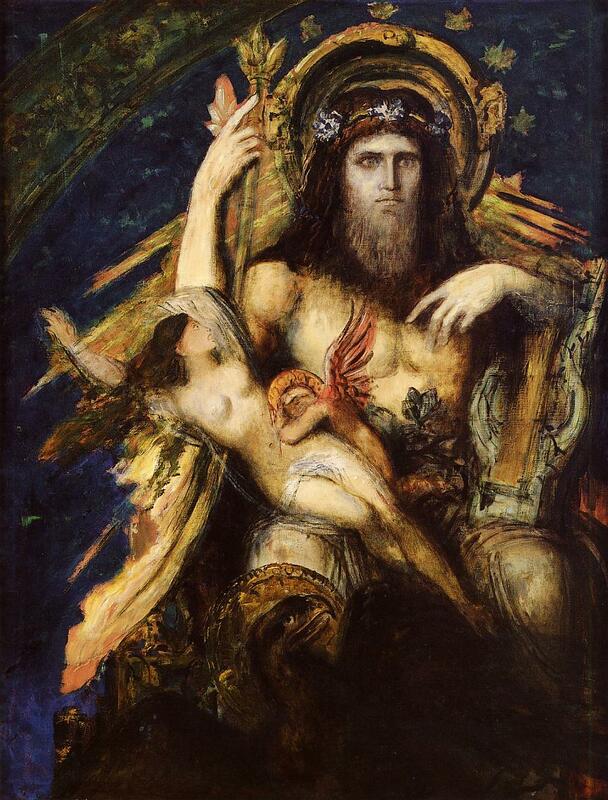 Jupiter now sits on a massive throne, with Semele draped over his right thigh. Surrounding the couple is one of the most iconographically-rich canvases in the history of art, a dense confluence from many cultures across Europe, North Africa, the Middle East, even into India. At its heart, Jupiter rests his left forearm on Apollo’s lyre. His right hand holds a lotus flower, and he looks straight ahead with his eyes wide open. Behind his left shoulder is the image of a female deity, perhaps Juno’s watchful and avenging eye. Semele is statuesque, her arms cast back in shock. Her left side is covered in blood, presumably from where the foetus has been extracted, although in this painting no foetus is visible. Her hair flows off in a long, thick tress, decorated like a peacock’s feathers, reflecting her transient displacement of Juno from being Jupiter’s consort. She shows no signs of catching fire yet. Below her is a winged Cupid, its face buried in its forearms, grieving at Semele’s imminent doom. This is a very difficult story to paint true to Ovid’s words, and trying to show them literally could only result in incredulity. As Moreau’s last great mythical challenge, he has surely succeeded better than anyone before. Posted in General, Language, Life, Painting and tagged Juno, Jupiter, Metamorphoses, myth, narrative, Ovid, painting, Semele. Bookmark the permalink.